Ok..enough of that. We’ve been traveling through Cool Ranch and we’re presently looking for the Duck of Death. It’s been a long journey through this hot desert like world. And we’ve had some interesting encounters with villains, town folk and distressed damsels, animal spirits and more. The Crew thinks the hardest part of our travels occurred in Arroyo Junction. I have to say I don’t totally disagree. We ran into some pretty nasty varmints down in Arroyo Grande East and West. But with a little fortitude we managed to defeat villain and foe, pick up some great treasure and even a new crew mate or two. Our missions also provided an opportunity for some of the crew to be promoted. Namely Jack Russell and Scratch. They’ve done quite well in our battles here in Cool Ranch and their promotions were certainly well deserved! Meanwhile we found a clue to Pollo’s map in Scorpion Cave. After all that is why we came to world..to look for more pieces of Pollo’s map. It appears this piece of his map has been stolen by some vile pirate named Captain Blood. An ugly looking spider captain from what we’re told. Ugh..I really don’t like creepy crawly spiders! But now we’re trying to find out where he has gone and who has that piece of the map now! Along the way I decided I deserve a new outfit for our goodly deeds! So while we’re traveling, I found a wonderful tailor who is weaving a new set of cloths for me. 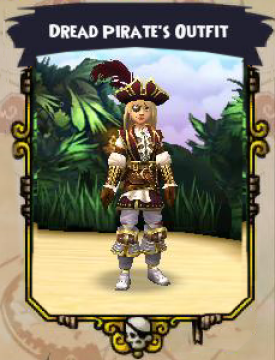 She calls it the Dread Pirate Outfit. I must say I rather like it and can’t wait pick them up when they’re done. They are much more “me” than this half Cool Ranch / Marleybone get up. Though I must say I have liked the swords. Still, I’m a pirate, not an Admiral in the Royal Navy! The clue sent us to Santo Pollo where we meet up with El Toro, who assisted us in defeating some corrupt Frogerales. We faced a few epic battles in the skyway over there as well. Who knew those little Banditoads could be so tough! We spent a fair bit of time running around Santo Pollo though. Especially through Bandito Trail. And we’ve been back to Los Muertos on several..I mean several occasions. Our mission in Santo Pollo was completed when we faced Santa Rana in the ‘governors’ palace in Castillo Sapo. Thankfully we had El Toro with us on that raid. I half expected him to ask if he could be part of our crew. But alas he wanted to remain in the town where he grew up and fight for justice to protect the people of his village. I don’t see much profit in doing that. But then that’s why we’re pirates and not town heroes. Oh wait..we are town heroes. Hmm…yeah well, there’s still gold to be had and we ain’t stopping now! Our journeys lead us back to Big Sky where we found some new quests to undertake for the Bison Shamans in Bison Village. In general, they’re a nice group of folk, those Bison guys. A few of them are rather nasty, but for the most part I like those folk. We were sent to speak with Thunderbird who would not help us because the Bison folk had dishonored the totem spirits. Now we’re taking on quests for a bunch of ghosts. Hey..if there’s a profit in it, I’m all for it! We learned about an evil Bison named Three Scars who found the Totem spirits: Brother Owl, Sister Snake, and Brother Wolf. He made pacts with them, but used their blessings for evil. Our mission: to avenge the Totem Spirits and bring peace to the spirit world. 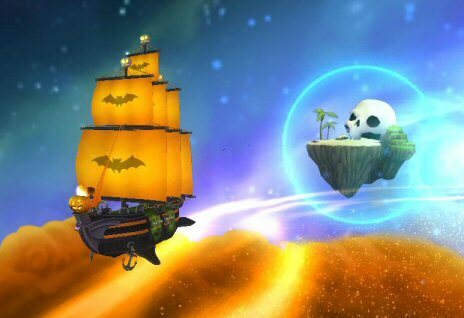 While in the midst of spirit appeasement, we received an invitation to the Isle of Kings for the 1st annual celebration of the Pirate Skyway. The Royals on the Isle of Kings threw a huge party for Birth-o-ween! And of course we attended the Gala celebration. And what a fantabulous event it was too! Our really big news from that grand celebration was a wonderful prize of our own! A new ship; the Glowing Ghost! Oh man is she yar! And very tough in a fight. The Crew and I really really LOVE this ship! The Glowing Ghost has truly come in handy in our mission to appease the Totem Spirits. Our last mission was with Brother Wolf. It seems he was the guardian spirit over Silver Rain, the Chief’s bride. She was blessed by Brother Wolf at her birth and she means, or I should say, meant a great deal to him. But Three Scars killed her and doomed her spirit to blindness which has kept her from walking to the spirit world. Our mission was to ease her spirit and restore her sight. For that we needed the magik help of Sister Snake. Thankfully we were able to gather the items for an antidote to the venom poison. Sister snake created a potion which we then poured onto the grave of Silver Rain. Her spirit emerged and announce “My sight is restored! 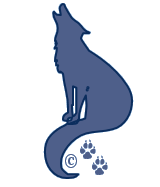 I can join my grandfathers and Brother Wolf in the spirit world.” Yeah! Now we’re off to continue our journey in Cool Ranch and our hunt for the Duck of Death! Our first stop, the Dusty Caves to collect some silver. 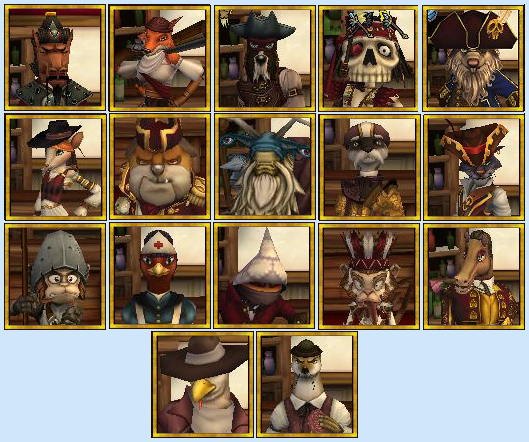 This entry was posted on November 16, 2013, in Captain's Log and tagged captain, game, hints, Kid friendly, kid safe, locations, log, online, Pirate101, Pirates, portal, quests, role play, ship, vessel. Bookmark the permalink.